What happens when you have to kill the only person who has your back? This might be the only intriguing question director John Hillcoat’s “Triple 9” asks as the latest cops-and-robbers flick, but with a slight twist that ends up pitting a police officer against his partner. When executed well — like in Ben Affleck’s “The Town”— it’s an entertaining template, but Hillcoat and writer Matt Cook fail to create compelling characters or a fresh story. Despite strong performances from Casey Affleck and Anthony Mackie, these characters resemble archetypes more than people. The film begins by introducing a swift and organized group of criminals robbing a bank in order to appease the Atlanta-based Russian mob blackmailing them. Some of the members are ex-military, while others, like Marcus Belmont (Anthony Mackie) and Jorge Rodriguez (Clifton Collins Jr.), are dirty cops. To pull off a separate heist on a government building, the group cooks up a plan to stage a “nine-nine-nine” — meaning offing a police officer to create a large enough diversion to distract the police from the robbery. Hours after the bank robbery, Belmont meets his new partner, rookie Chris Allen (Casey Affleck). The next day, the criminal group makes Allen the target of the “triple nine,” with Belmont the intended trap setter. It’s a good premise, but the star-filled cast is wasted — the most lamentable being Kate Winslet. Despite an impressive film career, Winslet’s performance begs to be forgotten. All of her scenes interacting with Atwood (Chiwetel Ejiofor) drag, failing to intrigue. It’s shocking, considering both actors’ immense talents, but the scenes, in addition to being dull, are just cartoonish criminal portrayals of undeveloped characters. Winslet is menacing and ruthless as Vlaslov, but is a one-note character, never getting a chance to show anything but shallow grit. Ejiofor attempts to bring the same redemptive complexity to Atwood’s criminal character as he does in most roles. However his paternal cravings to be near his toddler son aren’t enough to overcome a weak script, handcuffing his character despite Ejiofor’s best efforts. Similarly, criminal Gabe Welch (Aaron Paul) spends most of the movie reeling from his brother’s death from early on in the movie. Paul can play unhinged, depressed and desperate well, as he did in “Breaking Bad” as Jesse Pinkman, but he’s a little too unhinged here, at times wandering from complexly troubled to basic caricature. For all of its familiar faces, the film’s best character and performance is Affleck’s Chris Allen, the actor’s second turn playing a police officer following 2007’s “Gone Baby Gone.” Affleck uses his soft side in “Triple 9” in similar ways, as his natural vulnerability and charm cloaked in a thin layer of toughness make Allen a relatable hero. Mackie is similarly effective at playing a tough guy with hidden weakness. He’s shown this ability with his performances in “Half Nelson” and “The Hurt Locker.” He and Affleck aren’t giving exact replicas of previous films, but like all of the actors involved here, the script is too weak to provide fresh material for the actors or the viewer. 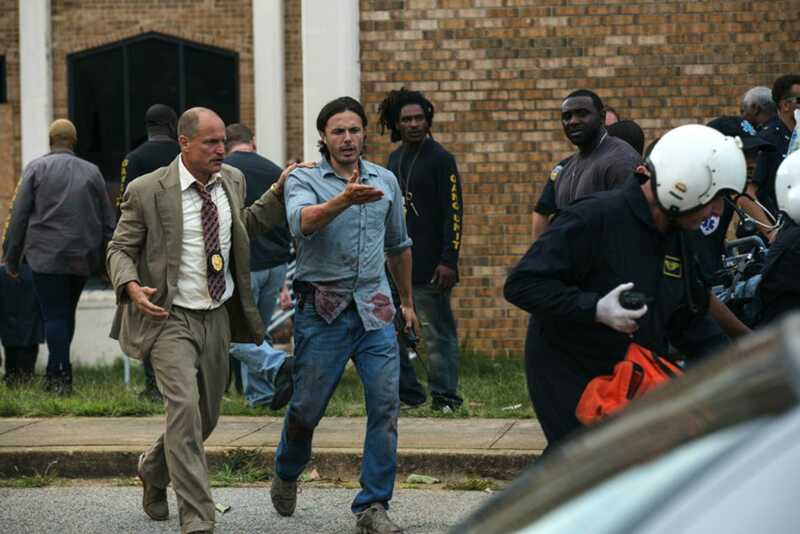 “Triple 9” is at its best when Mackie and Affleck are on-screen together. However the film spends too little time with them, and too much with the other criminals and mafia. The two actors almost save the movie from itself, playing out the story the movie should have focused more on — the good cop and the dirty partner too afraid to kill him. The film appears to reach its conclusion around the 90-minute mark, when Belmont takes Allen to the building where he has planned his murder. The sequences’ tense conclusion is good enough that it almost makes up for the film’s previous missteps and shallow characters. Though by the time “Triple 9” concludes another dull 20 minutes later, it’s far too late to call for backup.